Is my business ready for outsourcing? Is your business looking at reducing overheads and the burden of managing non-core activities? Would you like to improve operating performance, quality, timeliness, flexibility, productivity, and customer focus? Outsourcing will let you eliminate the fixed cost of internal staff, while you leverage on the service provider's best processes, capacity, systems, technologies, and well-trained resources. I know I want to outsource, but I have no idea where to start. The first thing you should do is list down all the activities that you can outsource. Record the cost, time, resources, and processes required to complete each activity if you do it in-house. Once your requirements are clear, you can move on to find a suitable vendor. Find a solution through which the vendor can do the work more efficiently than how you would do it in-house. What tasks can I outsource without affecting my core competencies? For small businesses, it is best to handle the core work in-house and outsource all or any of the support activities. You can outsource activities like customer support, telemarketing, helpdesk, designing, data processing, software development, financial management, web management, research and analytics, engineering activities, and a lot more. What organizational changes can I expect due to outsourcing? Based on the volume of work you might need some organizational restructuring. Appoint an in-house manager who can look after all aspects of outsourcing and ensure that the process is transparent, there is no communication loss, and optimum quality is delivered by the vendor. Your offshore team might be an extension to share the workload of your existing team, or the offshore team will handle the complete activity. In the latter case, you will need to do away with or reposition your in-house team. 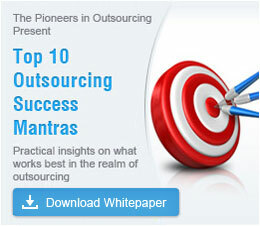 What are the real benefits that I can get through outsourcing? Apart from the obvious cost and time savings, and increased core business focus; small entrepreneurs can also expand their business by getting access to specialized services without the investment. By making your vendor responsible for superior service levels, you can ensure that you achieve higher efficiency, better quality, and customer satisfaction – at a much lower cost. You can leverage your vendor's process maturity, flexibility, technical capabilities, and experience of working with similar companies to get high volume of work done on time and within budget.